They are the children of “cholos” — the disrespectful name given to urban indigenous people in Bolivia. They refer to themselves in English single-syllable words and the names of their songs speak of indigenous pride; they criticise capitalism and demand a radical social change. This mix, so appropriate for these times, characterises the “hip hop” movement of El Alto, which is expanding and channelling youth rebellion in this large city of poor migrants, located at a height of 4000 metres and surrounded by impressive snow covered peaks. Bojorquez is the leader of alteno rap. He is 24 years old, wears beige baggy pants, mobile phone on his belt and a red hat tilted to the left with a badge that says “no to racism”. He speaks eloquently. He is the son of indigenous parents, for whom it’s difficult to understand their son’s “gringo” look and lifestyle. His surname can disguise his real background. Like in many other cases it has less to do with his roots than an attempt to “whiten” his ancestors to magically escape discrimination. That is how many a Quispe became Gisbert, while others were directly rebaptised with Spanish surnames. The situation has flipped around in the last few years, to the rhythm of marches and blockades that frightened the whites, and since the arrival to power of Indigenous President Evo Morales. In El Alto, more than 80% of its 900,000 inhabitants identified themselves as Indigenous in the 2001 census, and they say that if before it was an embarrassment now they are proud to be so. “As you see, as a result of this bourgeoisie, inequality increases day by day in our city/Look at those jailones [yuppies] walking down the Prado [main strip in La Paz], saying that I am not to their satisfaction/What false illusions they make in their minds insulting and humiliating the people”, says one verse from the song “Bourgeoisie”. “We don’t just sing about things like ‘I feel bad, my girlfriend left me and now I’m going to go and get drunk’, with a lot of cumbias [indigenous South American music]. We want to awaken the consciousness of the youth through protest music, but also through proposals”, says Bojorquez. They see themselves through the music of Tupac Amaru Shakur, the black leader of US “gangster rap” assassinated 10 years ago, son of militants from the Black Panthers, and with a name that makes him an icon for indigenous rap. “At the beginnings of the ”90s, the discos were only for tradition music and inaccessible in the poor barrios. The strategy was to make friends with the jailones from the southern zone of La Paz who had family members in the US so that they would copy the discs for us. We did not understand any of it because all the groups spoke in English but we liked the rhythm” recalls the rapper, whose music fuses traditional rap with the solemn sounds of the pututus (bull horns) and the more rhythmic windpipes and Andean tambourines, with words in Spanish and Aymara. The massive diffusion of rap began through piracy and today, in El Alto, you can buy a CD for 5 bolivianos (US$0.60). Bojorquez’s history is the same as thousands of inhabitants of this country, which in 2006 received some $500 million from the “export” of citizens. At the age of 11 he went to San Paulo to a textile factory and in that Brazilian city entered the world of hip hop together with youth from the favelas (shanty towns), who told stories which seemed to speak of his own life in El Alto. 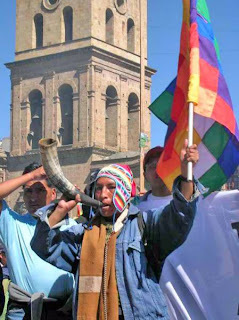 He returned to Bolivia almost 10 years later, in 2003, shortly before the altenos embarked on the “gas war”. These battles — which cost dozens of lives and brought down the government of Gonzalo Sanchez de Lozada — gave a new life to this form of protest music, born from the black neighbourhoods of New York in the ’70s and out of ethno-cultural indigenous pride. “The bells of a Bolivia marka toll/We don’t want anything to do with the TLC [Free Trade Agreement] nor ALCA [Free Trade of Area of the Americas]/We need to change the neoliberal model/Because it only brings social convulsion”, says the song “Latin America” in line with the nationalist eruption that this Andean country is living through. “What globalisation wants is for all of us to think the same, to control us like sheep”, says the youth leader in the studios of the radio where gangsters, like he was at the age of nine, “become rappers”. Today rappers also speaks to Evo Morales, in whom they are depositing their expectations of change for the majority of Bolivians, indigenous and poor, which here is almost the same thing. First published at Green Left Weekly. Translated from Spanish by Federico Fuentes, editor of boliviarising.blogspot.com.